Vilnius was founded in 1323 by the Grand Duke Gediminas and from then, through all the varying vicissitudes of Lithuania remained her capital, and, although under Polish occupation since 1920, is still her capital. Through the length and breadth of the country you will not find a single Lithuanian who will admit that Kaunas is anything but a makeshift." 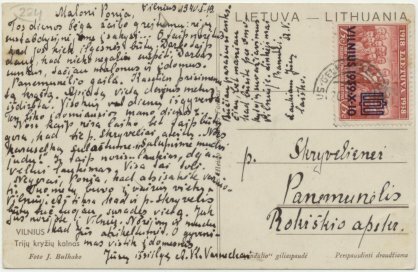 A card, sent from Vilnius . 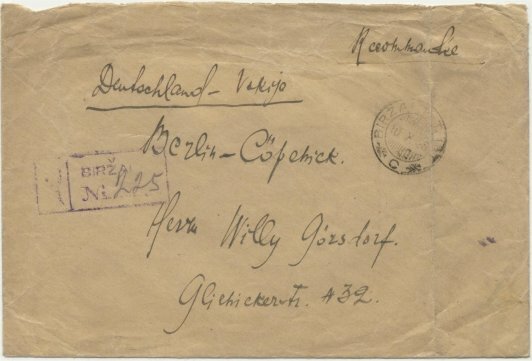 The postmark -with 'gezlink...' -must be of the railway-station-postoffice. 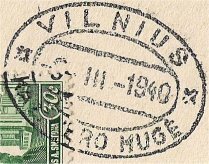 The postage stamp is the overprint, commemorating the return of Vilnius to Lithuania. This picture and all pictures below on this page, if not mentioned otherwise: scanned about 300 dpi. Then set right and cut out - noted the actual print size-, resized 25 % of this image and saved as jpg. At 9 oktober 1920 general Lucjan Zeligowski occupied the south-east of Lithuania -aboud one-third of the country -with the capital Vilnius (for Poland: Wilna). With this occupation start a long period of Polish administration in this area. On 10 October Vilnius was ceded on Lithuania and from 28 October 1939 Vilnius belongs (again) to Lithuania. On 27 October the Lithuanians begin marching in and sunday 29 October 1939 the Lithuanian troops have ocuupied Vilnius completely. After that only Lithuanian atamps are permitted for postage. 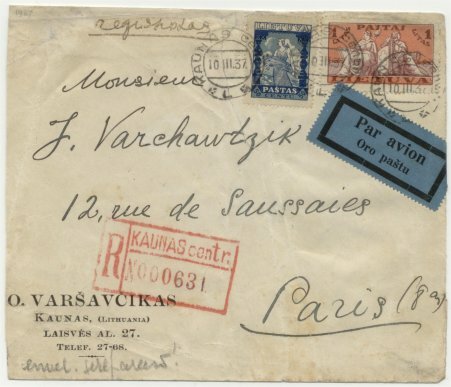 From this period mixed postage is known: the postage itself can be mixed, postmarks are used indifferently, the postal rates can be Polish-Lithuanian-Russian. 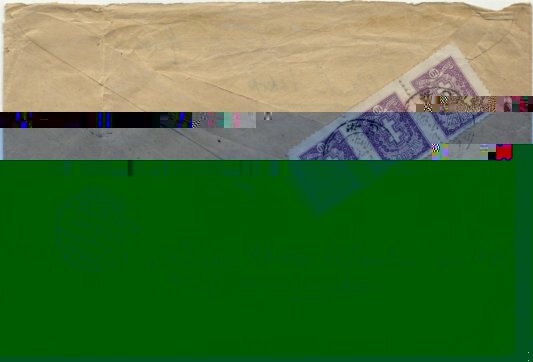 the stamp and postmark, resized 50 %. 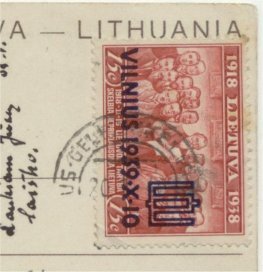 On the date in the overprint -1939-X-!0- the 'Assistance Pact' is made between Lithuania and the Sovjet-Union. In this treaty the Sovjet-Union agreed to return the Vilnius-area to Lithuania. 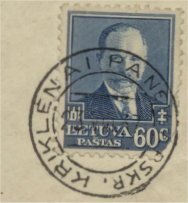 The overprint is in dark-blue. 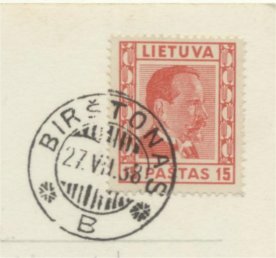 There is a rare trial overprint in black ink, in three lines (Vilnius under). A picture (in color) of one of the two known stamps in: The Charles Matuzas collection at Cherrystone / Vitaly Geyfman. - LPS 2012 ; No. 240. - p. 34-47: see page 40.
that means 'Hill of Three Crosses' an on this place -according the legend - seven Franciscan monks were crucified here in the 13th century. Crosses originally were erected in the 17th century but Stalin had them removed and buried and in 1989 were they rebuilt according to the original plans. Lithuania past & present / by E.J. Harrison (former British Vice-Consul in Kaunas and Vilnius). - printed 1922. This province is divided into seven departments named after their respective capitals, viz. Vilnius, Trakai (Troki), Lyda, Sventionis (Svenciany), Vileika, Asmena and Dysna. 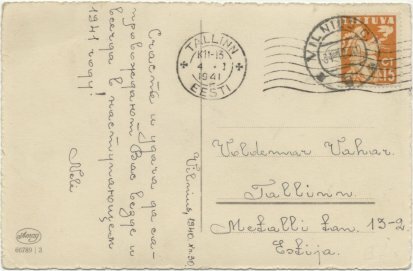 A card, sent from Vilnius to Tallinn. 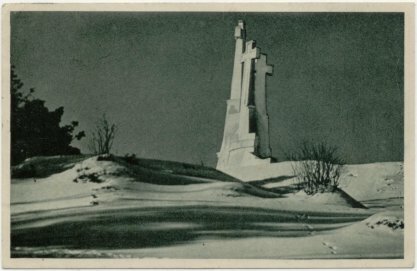 The date of the postmark is 1940, 31 December, and the picture-side is a Christmas-card. Lithuania ia already occupied by the Soviet Union, Soviet troops (15 divisions, 150.000 soldiers) crossed the borden on June 15, 1940. On the card is used a postage stamp -Michel No. 439- from the 'peace'-issue. This set of stamps (Mi. 437-442) is issued on more days: March 3, 1940 (5c, 30 c), April 18, 1940 (10 c, and this one: 15 c), July 19 (25 c, 35 c). The last days of use ware February 14, 1941(10 c, 30 c, 35 c) and March 24, 1941 (5 c, 15 c, 25 c). A short time, so the peace-issue is seldom on cover. 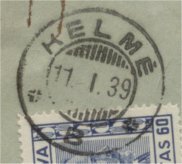 There are many postmarks with stolen or false stamps on all postage stamps. On 21 July 1940 the 'People's Seimas (Parliament) decided Lithuania to change in the Lithuanian SSR and asked the Soviet Union for joining. On 3 August the Lithanian SSR is 'admitted' to the Soviet Union. 1941, 22 June: invasion of the Soviet Union by Germany. 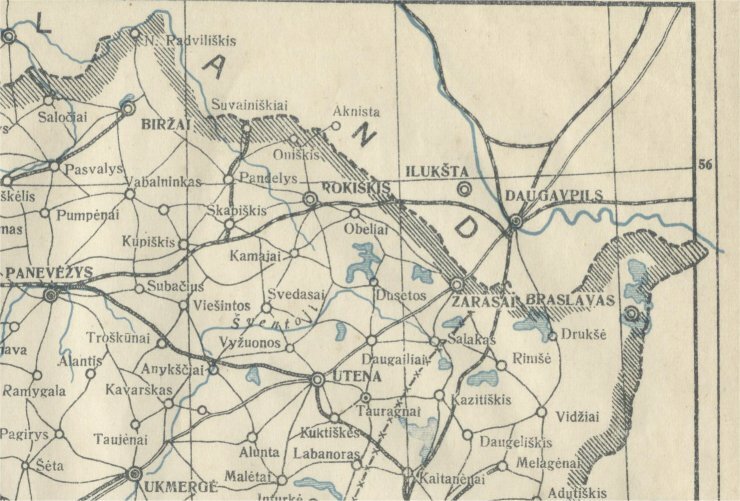 Naturally Lithuania never recognized the annexation of the Vilnius area, and there were also no railway connections between the Polish Vilnius area and independent Lithuania.The remaining connections, too, were disrupted: car, mail, and telephone. Not before a Polish ultimatum, March 17, 1938, were diplomatic relations restored on March 19. Thereafter the destroyed road connections and the railway Wilno - Kaunas were restored. Of the four railway lines to the Lithuanian border this was the only restored (April 11, 1938). Only now was Poland connected with Riga via the West European standard railways gauge width (1,435 mm). The route via Daugavpils to Riga remained at the Russian broad-gauge width (1,524 mm). On May 10, 1938 the post, telephone, and telegraph connections were also restored. 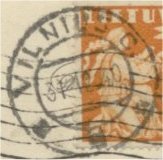 Cover to London from Vilnius, sent 23 February 1940. 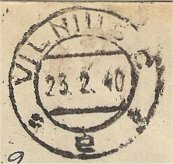 Reported serial letter with this postmark: a, b, c, d, e, f, g, h, i, j, k, l, m, n, o, r, R, S.
An overview of the postmarks of Vilnius in this period is given in the book of VytautasFugalevič and Martin Bechstedt. 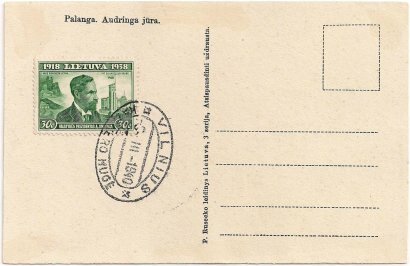 On this card is placed the only commemorative postal marking of Vilnius in this period. 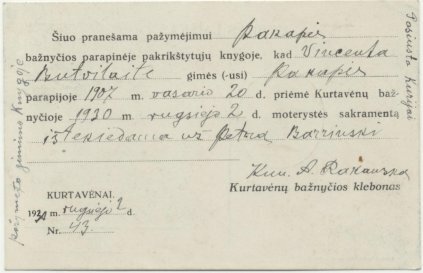 The text says: 'KAZIMIERO MUGĖ', Kazimiero MūgĖ, The (Saint) Casimir Fair, VILNIUS 3.III.-5.III.1940. The other side: a view on the beach of Palanga. In Kaunas -as 'provisional' capital- were established the consulates and embassies. Here you see a cover of the Dutch Consulate in Kaunas. In 1939 the the Dutch consul, Jan Zwartendijk, saved together with Mr. Chiune Sugihara (former vice-consul in Kaunas,) about 6000 jews Jews. Mr. Sugihara produced -without permission of his government- transit-visa for Japan. The honorary Dutch consul, Jan Zwartendijk, told Polish refugees he had gotten permission to stamp their passports with entrance permits for Curacao and Dutch Guiana, (now known as Suriname) situated in the Caribbean. To get there the Soviet government want a transitvisum for Japan, needed to go to the Dutch Caribbean. Most refugees never go to the, but directly to the United States or other countries, a group survived the war in China. 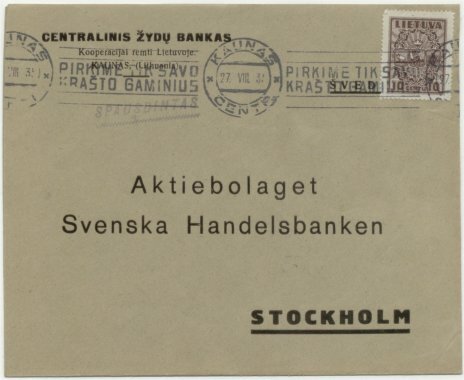 This cover is sent by the 'Centralinis Žydų Bankas' (=Central Jewish Bank) in Kaunas. The postmark means 'Let we only buy products of our own country'. Jews had a special position in indepent Lthuania and had an important position in the economy. More about the Jews in Lithuania, see Telsiai. PIRKINE TIK SAVA KRAŠTO GAMINIUS means 'Let us buy only products of our country'. This slogan is used in two different cancels of Kaunas (and in a cancel of Klaipėda). The other cancel of Kaunas with this same slogan. The postage stamp: 30 c. dark blue, Michel No. 290 (watermark 3, perforation 14¼), issued June 3, 1929. OR: Mi. 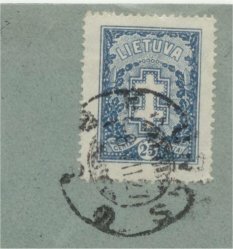 292 with watermark 5, issued January 1930. The cross is the 'double-cross': two crossbeams with same length, one in upside third, one in under thirth. The six ends are equal.The cross is called 'Lithuanian cross', 'Slowakian cross' and 'Vytautas-cross'. The 'Lotharingian cross' has two versions: the double-cross (as the Lithuanian) or the patriarchal-cross (the crossbeams unequal). For Lithuania the double-cross is a national symbol. For the first time Grand duke Jogaila used it on his shield (1386). Probable he wanted a cross as symbol -Lithuania was now Christian-, but another kind of cross as his ennemies, The Teutonic Knights. 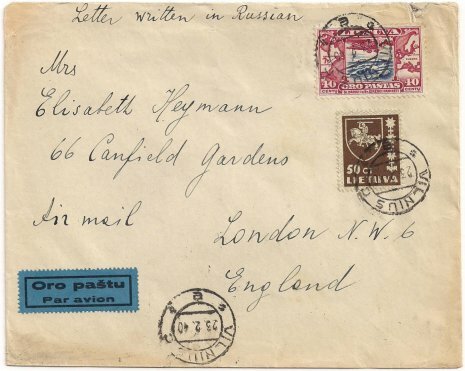 The foreign tariff for a letter to 20 g. was in the period January 1, 1923 - December 18, 1940 : 0,60 litai. So on the cover 60 c. is correct. As mentioned above, the foreign tariff for a letter to 20 g. was in the period January 1, 1923 - December 18, 1940 : 0,60 litai. 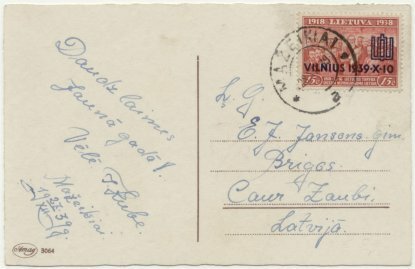 On this cover the complete set of the Darius-Girėnas commemoration-issue, issued May 18, 1934. On 20 c and 60 c Lieutenant Steponas Darius (1896-1933) and Captain Stasys Girėnas (1895-1933). On 40c. the airplane 'Lituanica' above the Atlantic Ocean. On 1 Lt. Angel of dead with the crashed plane. On 3 Lt also the 'Lituanica' and on 5 Lt. the 'Lituanica' with Vytis. 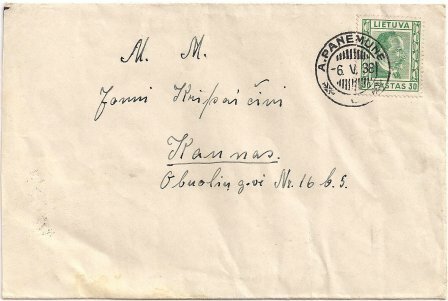 The cover has also a registering postmark of Kaunas. In Phillit is written more articles about registering in Kaunas. From 1930 when the Central Post Office commenced operations, new registration cachets were used. The registration cachet of this cover is -according the mentioned article above (part 2) used in 1935-40. Label on the backside, also resized 50 %. It is a customs control label. 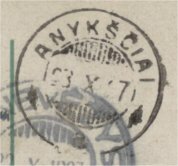 The arrival postmark of Anykščiai on a card from Panevėžys. Anykščiai is located in nothern-east Lithuania, on the railway-line between Panevėžys and Ukmergė. On this railway map (resized 50 %) from the thirties you see also in the east the demarcation-line with Poland. 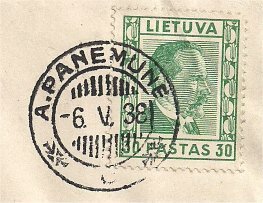 the postmark of Aukštoji Panemunė is mentioned, but there is no picture. According his information Aukštoji Panemunė belongs to the district Kaunas in this time. There is also a place Panemunė (Ueber-Memel, Upper Memel) in Memel, near the south-western border, now a border checkpoint to Kaliningrad Oblast. 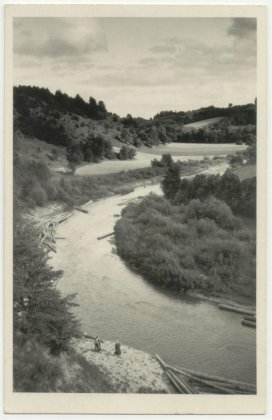 The place Aukštoji (Upper) Panemunė (Neman=Memel) on this cover is near Kaunas, on the left bank of the Nemunas (Memel). In 1916 the Germans have build a temporary bridge and in 1928 there came a more permanent bridge with Kaunas. In 1931 Aukštoji Panemunė became the western suburb of Kaunas and is formally incorporated in Kaunas. 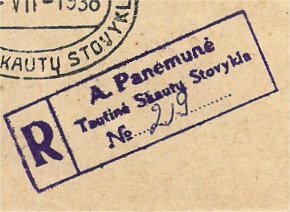 We see A(ukštoji) Panemunė also in a special postmark: a temporary post-office in 1938. This year the Lithuanian Scout Movement exited 20 years and this was celebrated with the second National Camp. More than 1600 scout-boys came together near Aukštoji Panemunė,. The girls, more than 1400, came together near the monastery Pažaislis. By the post were issued special stamps with overprint: overprints of the first national olympiad-stamps. The stamps 5+5 and 60+15 with the emblem of the scouts and the text 'Tautinė skautu sovykla'. 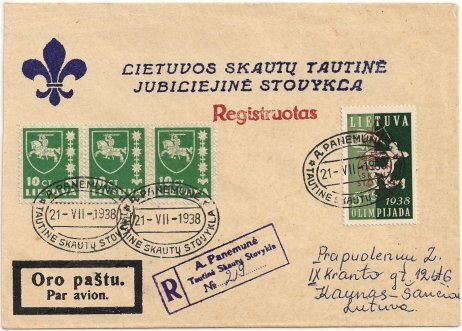 The stamps 15+5 and 30+10 with the emblem of the girl-scouts and the text 'Tautinė skauciu stovykla'. 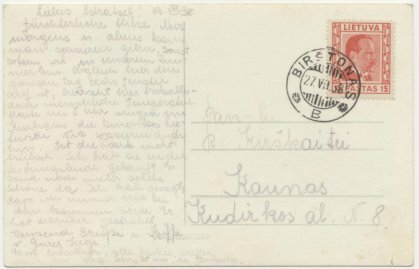 On rhe cover here is used a stamp with the first overprint and 'sent' registered from the post office in the camp of the boys. 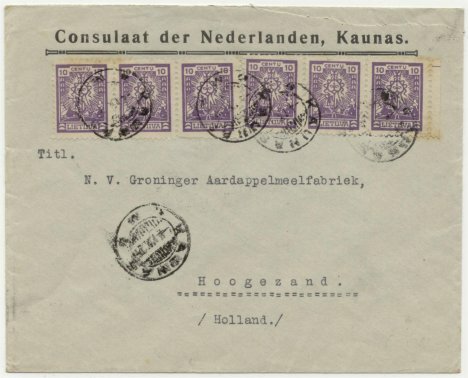 In both camps were opened temporary postoffices with special postmarks. 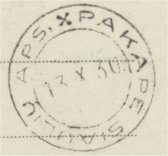 The boys camp had a post office with in the postmark A. PANEMUNĖ, and the post office in camp of the girls had a post office with in the postmark PAŽailis. Also in the registered postmarks we see these names. But here we see a falsification. The camp for the girls was open from 12-20 July, but the camp for the boys was open from 1938, July 8 to July 18. 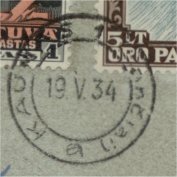 So the date in the postmark -21 VII 1938- is impossible. There is a list with genuine registered covers with dates and correspondending registering-numbers: 13.VII.38 (no. 7, 13, 14 and 15), 17.VII.38 (no. 96), 18.VII.38 (no. 119, 122, 128 and 132. If the number of the registered cover not good fits in the series dates, then it is a falsification. From the reported dates and numbers you can conclude that thre are send about 150-200 registered covers from the post office. The number of this cover is 219, very high. 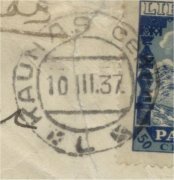 In the real registering postmark the R has right a pointed paw: on this cover the R is not pointed and so fals. 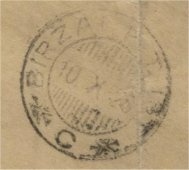 Further: The genuine special postmark has after A a little vertical indent, this false postmark has a point. Also is on false covers the point above the E of TAUTINĖ end above the last E of PANEMUNĖ not clear of is missing. In falsifications has also often the sign under the Ų different shape. 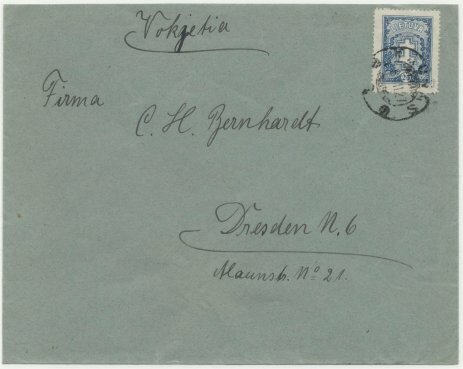 Some falsifications are vere clear: a combination -and that is done- of the special postmark of Paižailis and the registering postmark of A. Panemunė on the same cover. 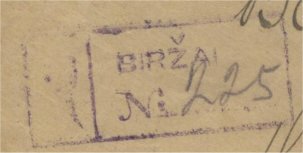 In this Handbook there are two postmarks reported of Birštonas, with code letter 'b' and -as here above- 'B' . On the picture-side: I suppose near Birstonas, an area with a beautiful nature. Birštonas belongs in this time to the district Alytus in southern Lithuania. A-unpublished, only on cd-rom- book : place names in normal and 'reverse' order, administrative subdivisioin 1795-1995, geographical maps, 400 pages, bilingual article Lithuanian-English. In the section 'place names 1800-1945 of this book is also mentioned the other name of Birštonas: Birštonai. 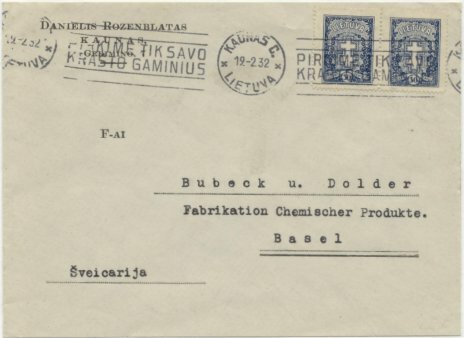 The Handbook of Fugalevicius report also two postmarks with the name Birštonai, code letter 'a' and 'B'. Cover from Biržai, a little place in northern Lithuania. 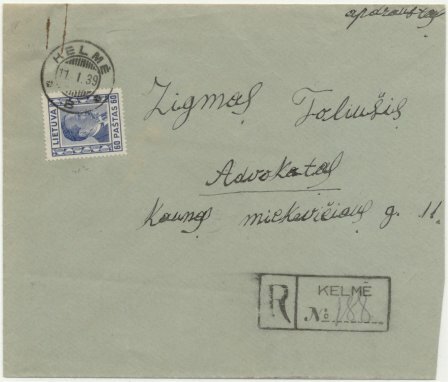 A registered cover, sent January 11, 1939, from Kelmė. The cover is sent to the -I suppose local- lawyer (on the cover: advokatas = lawyer). 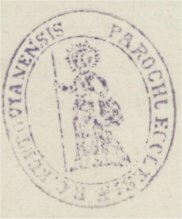 The registering stamp of Kelmė. 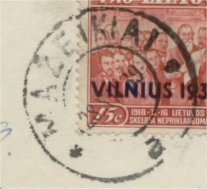 Part of a cover from Kriklėnai. The place is located in the district Panevėžys. 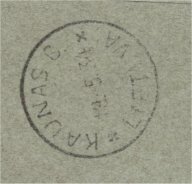 This is also indicated in the postmark. 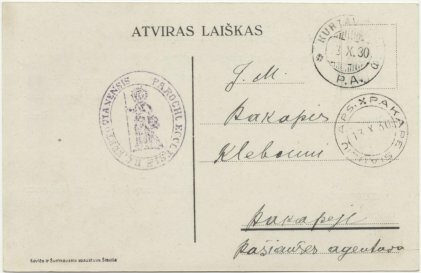 Card, sent to "His Kindness Pakapė parish priest in Pakapė Pašiaušės agency." 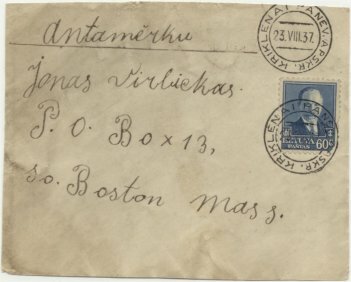 On the left side the cachet of the sender, the Kurtavėnai parish. As religious institution: franking-free. 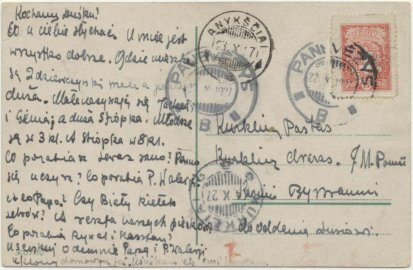 in the book of birth"
Vertical text at the right: "sent to curia"
Here a card from Mažeikiai, a place in northern Lithuania. 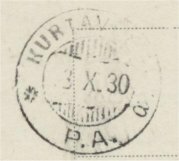 The postmark is the first postmark of this place in this period -serial letter a- and used here very late. 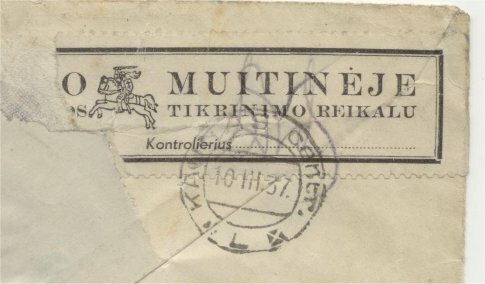 Other reported postmarks: with serial B, D, e and F.
On the map is clear that Mažeikiai in this time was an important railway-junction, as it also was in tsaristic times. 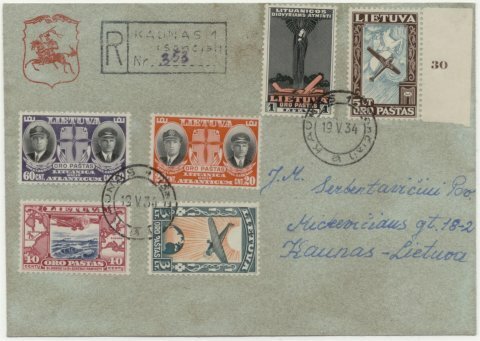 Postal markings of Lithuania 1918-1940/41, illusatrations with types and dates of use: Lithunian standard postmarks, maritime postal markings, railway post, fieldpost markings, commemorative postal markings, postal machine (slogan) markings, commercial machine prepayment, provisional cancellations, cyrillic standard postmarks 1940/41, Data-facts-information-literature, supplement.